It is well known within the legal world that most cases settle before they ever get to trial. Generally, less than 3% of civil cases reach a trial verdict. So, around 97% of cases are resolved by means other than trial. Whether we’re talking about an employment or contract dispute, a car accident lawsuit, or even a real estate matter, the parties in a civil case often choose to settle their case rather than leave their respective fates in the hands of an unpredictable jury. So, why is the percentage so high? Everyone has their own theories, each of which probably has some element of truth. There are several reasons why it may be better to settle a case rather than going to trial. Trials are expensive. Trials are stressful. Liability and damages are difficult to determine when your case is decided by a judge or jury. Trials and appeals can take years, whereas settlements can (theoretically) take one meeting with the opposing party and counsel. Settlements can be completely private, whereas trials are generally open to the public. Moreover, a defendant does not need to admit liability when in a settlement, whereas a trial may determine liability. That being said, there are definitely times when it is better for a party to take a controversy all the way through trial and even an appeal if necessary. Sometimes, you may find yourself in a controversy with another party that seems to have no mutually agreeable solution. You cannot force the other side to settle, so you may have to litigate through a trial. Before going to trial, however, it is crucial to understand that the process will not be easy or cheap. If you are representing yourself in trying to negotiate a settlement but find that it is not working, this is probably a good time to discuss your options with an experienced Scottsdale litigation attorney. According to Cornell Law School’s Legal Information Institute, “[l]itigation is the process of resolving disputes by filing or answering a complaint through the public court system.” The nature of this complaint (including the probable outcome for each side) becomes the basis for any settlement negotiations.” Once the party with the complaint “presents the claim” (i.e. informs the other party about the controversy) and states why the other party is responsible for the damage done or harm suffered, negotiation can begin. Some claimants offer proposed solutions to the problem and some threaten a lawsuit. If an agreeable solution between the parties cannot be met, then the party may take the other party all the way to court in what has escalated into a full-blown lawsuit. As noted at the beginning of this article, litigation can be an unusually long and costly process. Aside from court fees and attorney fees (which can quickly add up in the course of litigation), properly litigated cases often also involve expenses related to hiring expert witnesses, collecting and creating reports, analyzing those reports, deposition fees, paralegal fees, and investigation fees. That is just a sampling of some of the fees associated with litigation. It is a good rule of thumb to do try every reasonable option to avoid litigation. Unfortunately, litigation may be the only option you have left if you are dealing with an unreasonable opposing party. Of course, if you want to take a party all the way to trial (assuming you have grounds for doing so), then it certainly is right to exercise that option. Sometimes lawsuits are filed so a plaintiff can satisfy a very personal or profound sense of right and wrong, or to make an important point that impacts more than the parties in the case. That is, sometimes the end goal is not about proving the other side is liable to you for damages, but may be for bigger reasons that go beyond you. For cases challenging the constitutionality of laws or other injustices, settling would not be a good option because it fails to create desired precedent and will not affect public policy. Your claim is against someone close to you. Friends, family members, and business partners can be the most difficult people to agree with. Unfortunately, parties tend to destroy invaluable relationships in the process. Litigation can be a very hurtful process when you care about the people on the other side. If you and the party both feel like your relationship is more important than the outcome of the trial, it is a good idea to try to settle. Expenses add up quickly in court. For example, if you stand to gain $20,000 from someone in court and they offer you $12,000 to settle, you could very likely gain more by taking the offer and avoiding the expenses of trial, including court and attorney fees. 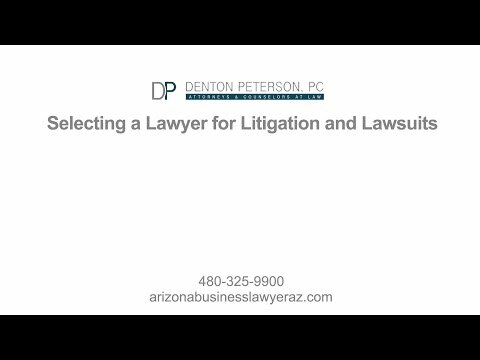 While you can never be entirely sure about the cost of litigation, talking to an experienced litigation attorney in Phoenix may help you perform a cost-benefit analysis to figure out which is the better choice from a financial perspective. Your time is not worth it. Aside from the money, your time may just not be worth the effort. Litigation takes time and often leads to more time due to appeals and retrials. You will have to be involved as the trial progresses. Whether you are the plaintiff or the defendant, if the total time spent in litigation is not worth a good outcome in court, then settlement is probably a better option. The outcome of the case is unpredictable. If your case appears to be a toss-up, you are probably better off settling. While there may be a chance of winning and taking home the large sum of money, you will be out court fees, attorney fees and much more if you lose. In these cases, settlement is usually a better option because both parties seem to have more to lose than to gain. The uncertainty of the outcome on both sides of the case is often what forces the parties to ultimately settle. Deciding whether or not to settle or litigate a case is not a matter to be taken lightly. Litigating will take a great amount of time, money, and emotional stress, especially when someone you are about is involved. However, it may be the right option for you, especially if you are backed into a corner by a disagreeable party. If you need to file a complaint, have found yourself on the receiving end of one, or are concerned about any settlement offers, give us a call and we can help. An experienced litigation attorney in Scottsdale should be able to provide you a good analysis of whether your case should settle or whether you should go to trial.